Employee was subjected to random check at 7:15 a.m. Thursday. He had a .22-caliber revolver and at least five bullets. He is charged with carrying a pistol without a license. 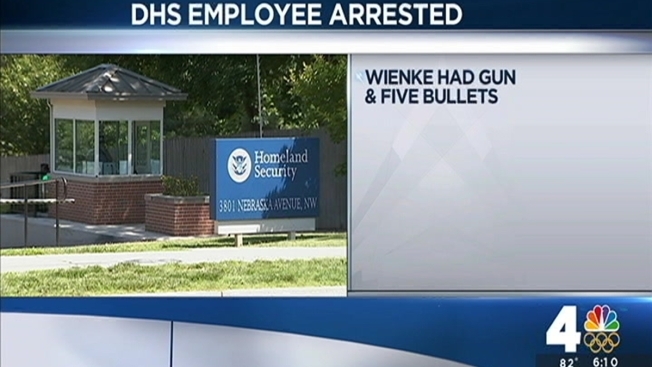 A U.S. Department of Homeland Security employee took a handgun into headquarters in northwest Washington Thursday morning, according to DHS. Jonathan Wienke, 46, who works in Homeland Security's Office of Intelligence, was subjected to a random check when he arrived at work about 7:15 a.m. Thursday, according to the police report. He had a .22-caliber revolver and at least five bullets. He was detained, then turned over to the Metropolitan Police Department and arrested. He is charged with carrying a pistol without a license. Homeland Security is considering its own disciplinary action, a spokeswoman said. Wienke’s lawyer declined to comment.